Cool temperatures and confident winemakers lead to standout vintages. Some of the coolest Northern California vineyards have yielded notable top-rated wines. Look for three stunning sparkling wines from the iconic Schramsberg winery, and nine outstanding Pinot Noirs grown in coastal Mendocino County, practically within earshot of the Pacific surf. Schramsberg is located in Napa Valley, but uses grapes and base wines from several North Coast counties for its consistently luxurious and elegant sparkling wines. The Davies family celebrated its 50th anniversary as Schramsberg’s owners last year with the release of long-held library wines, including selections from the 1999, 2000 and 2004 vintages. Now, three great Schramsbergs from 2007 are continuing the celebration. The 2007 Reserve uses Mendocino County as its primary source and shows the ripe vintage’s character in its big, spicy fruit flavors and broad texture. For exciting Pinot Noirs, look for 2013s from the Anderson Valley, which had a warm and ­virtually trouble-free growing season. The harvest was both large and of excellent quality, ­arguing against the old adage of high yields equating to low quality. The harvest was both large and of excellent quality, ­arguing against the old adage of high yields equating to low quality. Phillips Hill and Baxter wineries in particular seem to have found a confident stride in winemaking style and have released some of the most adventurous and nuanced Pinots in California. While the wineries are independent, they share some grape sources, including Valenti Vineyard on Mendocino Ridge and Oppenlander Vineyard. 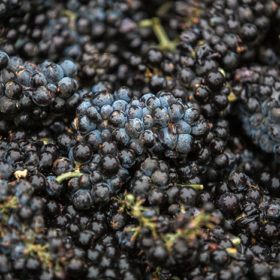 Hands-off winemaking is also a commonality between the two, often preferring native yeast fermentations and using whole clusters rather than destemmed berries. Phillips Hill 2013 Oppenlander Vineyard Pinot Noir (Mendocino); $48, 94 points. An outstanding example of balance and reserve that doesn’t lack in flavor, this wine will pair well with a wide variety of foods. It has a mild color as well as spicy, woodsy aromas due to 35% whole-cluster fermentation. Satisfying flavors resemble a wine-reduction sauce but are dry and crisp. Editors’ Choice. —J.G. Baxter 2013 Ferrington Vineyard Pinot Noir (Anderson Valley); $52, 94 points. The most fruit-driven of the Baxter 2013s, this wine has beautiful, bright cherry aromas, pure cherry and raspberry flavors, medium body and enough support from acidity and moderate tannins to provide an appetizing balance. The fruit is especially tasty on the tongue and continues to linger on the finish. Drink now through 2020. —J.G. Big Basin 2013 Woodruff Family Vineyard Pinot Noir (Santa Cruz Mountains); $59, 94 points. Relatively light in color, this lower-alcohol wine from a vineyard in the Corralitos area shows dried rose petals, bergamot, lavender, cinnamon and a tiny bit of mushroomy funk on the nose. Once sipped, pomegranate, dark cranberry and orange-peel elements are lifted by pencil lead, rosemary and a strong thyme component. —M.K. La Follette 2013 Van Der Kamp Vineyard Pinot Noir (Sonoma Mountain); $42, 93 points. Tangy, juicy, fresh and fun, this vineyard-designate, a consistent star in this producer’s arsenal, is densely layered, supported by an oak structure. Black plum, black cherry and raspberry cross paths to offer a spark of ripe fruit before succumbing to several shakes of Asian spice. —V.B. Sojourn 2014 Gap’s Crown Vineyard Pinot Noir (Sonoma Coast); $59, 93 points. This is a gentle giant of a wine, subtle and sublime in earthy rose petals, allspice and black tea that maintain a spiky, lively acidity throughout. Blueberry and black cherry compete for attention, balancing the grapes’ more savory intentions, before a smoothly intense finish rides things out. —V.B. Breathless NV Méthode Champenoise Brut Sparkling (North Coast); $25, 88 points. This wine is not called a rosé on the label, but it has a definite light-salmon color and refreshing light red cherry and subtle strawberry flavors that resemble rosé. It feels medium bodied, smooth and frothy, and not too tart. —J.G.